style="color: #000099;">What is My Dinner Connection? My Dinner Connection is a new concept in family dining that provides you with ready-to-prepare meals to accommodate today's busy lifestyle. We help you complete this process in 3 easy steps! You assemble 8-12 entrees while rotating through stations. Each entree station will be stocked with ingredients, easy-to-follow recipes, take-home packages, labels, and complete cooking instructions required to assemble a particular entree. Each month we will offer 14 new entrees for you to choose from. All of these entrees have been personally tested and tasted by our friends and families. You simply arrive for your 90 minute session ready to have fun, socialize and assemble your pre-selected entrees at the stations we have set up for you. Bring a laundry basket, cooler, or large bag to transport your entrees home. We will provide snacks and beverages for you to enjoy during your session. Take the entrees you have prepared home and pop them into the freezer. All entrees are in freezer-ready containers for you to prepare and enjoy at a later date. Entrees are all labeled with contents and preparation instructions. Whenever you need a delicious easy-to-prepare home-cooked meal simply thaw, prepare, and enjoy dinner. Use the time you've gained using My Dinner Connection meals to reconnect with your family. Enjoy relaxing dinners after a busy, stressful day. It really is as simple as 1 - 2 - 3 with My Dinner Connection. It's tasty - it's fun - it's simple! 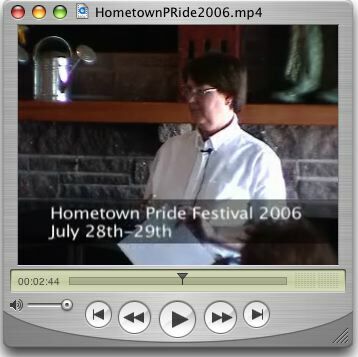 The Hometown Pride Festival is July 28th and 29th this summer. Lynn Schurman was recently the guest speaker at the Cold Spring Area Chamber Noon Luncheon held at the Riverside Inn in Cold Spring. Schurman, who has been a key leader with the festival for over 10 years, talked about how this years event will again be held at the Gluek Brewery parking lot. Special activities are also being planned during the festival that will commemorate Cold Springs 150th anniversary as a city.